By not being thorough in my crank set installation, I stripped the pedal threads out of a brand new crank. I see there are tap sets to repair this, but they are much too expensive. The Var set which comes with tap and plugs sell for over 100. The Unior is double. The plugs themselves are not priced badly. Does anyone know if the threading for the plugs is standard? In other words will any standard tap set work? How bad is the damage, how many threads are stripped? That will determine whether you can recut the existing thread with a pedal tap or if you need to put in a thread insert. The insert taps are either 5/8x24tpi or 20tpi. They are not like normal taps, they are longer because they have a reamer to enlarge the hole as they cut, removing the need to drill the crank. That presumably also helps keep everything square and makes it a one pass operation. If you have the skills and equipment you could drill or ream the hole out and then tap with a standard tap, ensuring it is square. If you don't have the tools and skills I would've thought the chance of messing it up is quite high. About half the threads are stripped out. I was able to ride home with it. It's not an urgent project as I had a replacement crank, but it just seems like a waste to have a brand new crank set just sitting there. My plan was to go to my auto mechanic for the ream/tap and put in the plug myself. MarcusT wrote: My plan was to go to my auto mechanic for the ream/tap and put in the plug myself. I'm not sure what the logic is here; do you expect a random auto mechanic to have the correct reamer and taps? The former are essentially like springs, i.e. there is a diamond profile wire (often stainless steel) wound into a spiral, and this is made oversize so that it is always a snug fit in the (newly tapped) hole; strictly speaking anything described as a 'Helicoil' ought to be this type (although Helicoil is/was a trade name and besides which the term is misused...). You can tell this type of insert because the end of the spring is formed into a tang that protrudes into the bore of the insert; the tang is used to wind the insert into position, and is deliberately weakened so that it can be snapped off clean when the insert is in the correct position. There is a whole knack to using this type of insert; normally they work best with some threadlock but this isn't strictly necessary in all cases. Because of the structure of the insert it is very likely that threadlocking compound will leak through to the inside of the insert and an ungreased fitting inside the insert can be accidentally bonded too. Apologies if this is obvious but it is a necessary requirement for this type of insert that the repair tap has the same pitch as the thread being repaired. The taps for thread repairs of this sort are a completely non-standard size. The 'solid' type of insert is machined from solid material as the name suggests. The fit of the insert is critically dependant on the tolerance of the tap and the quality of the tapping operation. It is normal to use high strength threadlock when installing this type of insert. It seems obvious that this type of insert ought to work best if the thread pitch is the same inside and outside, provided the internal thread is correctly 'timed' to the outer, but in fact this type of insert need not have the same thread pitch on the inside as the outside, provided there is some clearance on the diameter (i.e. the wall thickness of the insert is large enough). Most pedal/crank thread repair inserts are of this type (i.e. with a different pitch inside and out) and have a surprisingly thin wall where threads intersect. An attraction of this repair method is that (tolerances aside) the threads on the inside and the outside of the insert can be standardised threads. Icetoolz kit E521 uses wire wound inserts. The kit includes a tool that acts as a guide when installing the inserts, but (IME) such a tool is not really necessary in most cases. However the inserts are both expensive and they look a bit short to me; probably a bit shorter than the average pedal thread. There may be pedal thread repair kits from other manufacturers that use this kind of insert, but if so, I don't know of them. The most common type of insert (e.g. 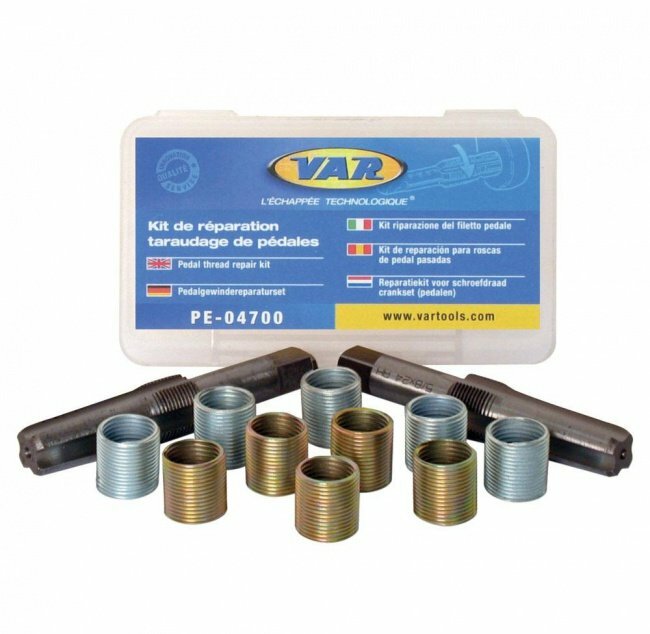 VAR, UNIOR) is solid steel and uses RH/LH 5/8" x 24tpi external threads (in fact I have never seen solid inserts which are 20tpi outside) in combination with the RH/LH 9/16" x 20tpi internal threads. I don't know if the inserts are toleranced similarly or not (so probably best to stick to inserts from the same maker as the tap), but they are often plated slightly differently so that you can tell LH threaded ones from RH threaded ones. Plated (non-stainless) steel is a good material to use with many types of threadlocking compound; normally the bond strength is stronger than if a stainless steel part is used, because the threadlocking compound reacts with the metal itself, and it reacts better with things other than stainless. With this style of insert there is much less chance of getting threadlocking compound inside the insert. There is a nice article about using pedal thread repair inserts on the Park Tool website (even though PT don't offer such a repair kit). However there is one confusing detail; the article talks about 5/8" x 20tpi inserts, but pretty clearly shows inserts with a 5/8" x 24tpi external thread. One thing that isn't made abundantly clear is that if a crank is ridden with the pedal loose, and then the pedal drops out, the hole in the crank will invariably be rather skewed. This means that unless great care is exercised, the repair reamer/tap is liable to follow the skewed alignment (if it is used freehand). It is a much better idea to use a jig (e.g. drill press or milling machine) to hold the reamer/tap in the correct alignment if you want the repair to be really accurate. I will attempt to do the repairs for a reasonable price, otherwise, it's just not worth it. I don't see the sense to pay for a repair kit that cost 2-3 X more than what the crank set costs. It's not a tool I foresee ever needing again. needless to say, some bike shops have the correct tools and will do this repair at a reasonable cost. Brucey wrote: needless to say, some bike shops have the correct tools and will do this repair at a reasonable cost. Appreciate all Brucey, but my LBS will not give me the time of day unless I spend a couple thousand there. I've had people ask me to do repairs/ maintenance on their bikes because this shop is not interested. I don't mean to be rude, but if you have stripped the threads of a new crank, what makes you think you will do a good job of cutting new threads? S2L wrote: I don't mean to be rude, but if you have stripped the threads of a new crank, what makes you think you will do a good job of cutting new threads? I had not tightened the pedal enough and became loose whilst pedaling, that was the cause of the strip, not the installation. Not sure. Pedals do themselves tighter as you pedal, rather than viceversa... I normally never torque them, screw them on. Also, if it worked itself loose, you should have noticed that well before the threads got damaged. Screw the pedal into the crank from the inside of the crank. This may clean up the threads sufficiently for you to have another try from the right side, and save you some agro and pennies at the same time. You've nothing to loose if it doesn't work. - that the pedal spindles have incomplete shoulders, i.e. the spanner flats go all the way to the crank.